Experts are examining a mysterious slime in a Somerset nature reserve in the wake of a meteor strike thousands of miles away in Russia. 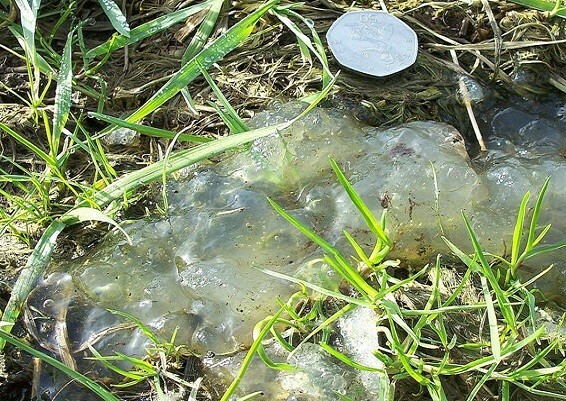 Translucent goo which resembles “something living” was discovered at pretty Ham Wall reserve by nature lovers. Theories abound about what the jelly is, from “crystallised brain fungus” to the decomposing remains of a dead frog. The unexplained blobs had cropped up all around the reserve. “This past week we’ve been finding piles of this translucent jelly dotted around the reserve,” he said. “Always on grass banks away from the water’s edge. According to local folklore, the substance appears in the aftermath of meteor showers. Previous manifestations of it date to the 14th century, according to records. During that period the slime has acquired celestial monikers including “star jelly,” “astral jelly,” or even “astromyxin”. Royal Society for the Protection of Birds spokesman Tony Whitehead said: “In folklore it is said to be deposited in the wake of meteor showers. It’s great that in this day and age that there are still mysteries out there. “Our reserve team will be looking out for the slime over the next few days.